One hundred sixty mouthwatering recipes with a twist from different Filipino chefs across the country but only nine of them will battle out at the grand cook-off of the first-ever Funlasang Pinoy Twist Fest competition by Unilever Food Solutions (UFS) Philippines. These finalist chef are challenged to deliver the best tasting and most innovative classic Pinoy dish with a twist that will surely fuel the love of Pinoys for food. esteemed culinary experts Executive Chef Fernando Aracama of Aracama Filipino Cuisine, UFS Senior Sous Chef Brando Santos, and UFS Senior Sous Chef Paulo Sia based on the creativity of the twist, food taste and presentation, and the use of UFS products. During the event I was able to try different dishes from food booths. 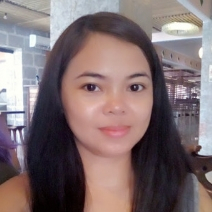 Food with a twist is something truly fun for Filipino taste buds. With this innovative food ideas we bring out the most fantastic food creation that we never thought that its possible. 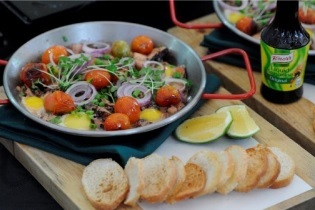 UFS Senior Sous Chef Paulo Sia, shared his own recipe of Grilled Pan De Sal Salpicaohis own classic Filipino dish with a twist. Also I was able to witness the nine talented Pinoy chefs in showcasing their ability in making a classic Filipino dish that we never seen or tasted before. 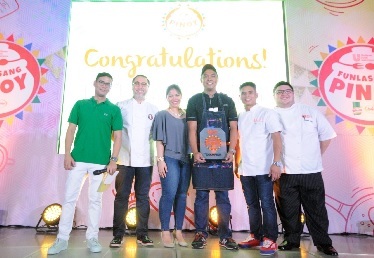 Among the nine finalist, Chef Danilo Puga II, who presented an original Octopus Sisig recipe as his best- tasting Pinoy dish with a twist, was recognized as the first-ever Funlasang Pinoy Twist Fest Champion. He brought home the P100,000 cash prize from UFS and exclusive publicity features. Congratulation to you Chef Danilo Puga II!